Bad to the Bronze ($6.99) is one of those shades I've been wanting to pick up for a very long time now. It is a gorgeous, pigmented, metallic bronze with a soft and smooth texture. The color looks a lot like MAC's Woodwinked in the pan but, they turn up differently on the lids. Woodwinked has a duo-chrome quality that this one doesn't. Bad to the Bronze is still a fantastic base for shades like Woodwinked and also amazing when worn by itself. Since it is very metallic and pigmented, I have to be extremely light handed else, it ends up looking very frosty on me. I like to use a fluffy brush like the MAC 217 or my fingers to blend it in. The texture blends like a dream and stays put for hours together. If you tend to gravitate towards nudes or bronzy browns, Bad to the Bronze is excellent to have in your stash. It is quite versatile and looks great by itself all over the lid or with a darker shade along the crease. If you have medium/dark skin tone, just be sure not to go overboard unless, you don't mind the frosty look. Have you tried the Maybelline EyeStudio Color Tattoo 24HR Cream Eye Shadows? Wheee! You got Bad to the Bronze! I love this shade. I followed you on GFC & BlogLovin! 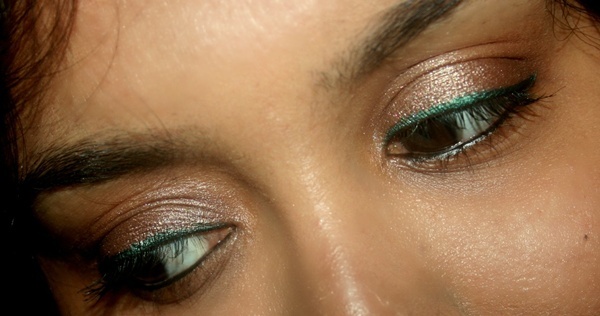 This looks gorgeous on you, especially with that amazing green liner!